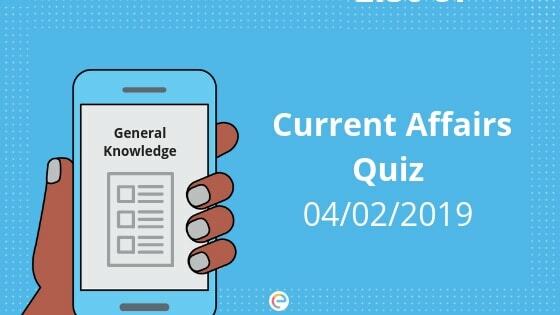 Current Affairs Quiz for February 4, 2019: This section covers the GK and Current Affairs quiz with daily MCQs on National Affairs, International Affairs, Economy, Banking Affairs, Polity, Geography, Environment, Sports etc. for competitive examinations viz. UPSC, SSC, Bank PO, Bank Clerk, IBPS, Railways, Government Jobs, UPPSC, MPSC, and other state exams. This current affairs quiz will help you in General Awareness section conducted in various Banking, SSC, Insurance, Railways, and other govt job entrance exams. Current affairs quiz will also help you outshine in the crowd with all the information you gain from this article. 1. The name of the Kisan yojana launched recently by the Union Government in the Budget 2019 is __. Explanation: To provide assured income to small and marginal farmers, the Government has introduced a historic yojana- Pradhan mantri kisan samman nidhi. Under the yojana, the vulnerable farmers, who own around 2 hectares of land, will get direct income support of Rs 6000 per year. 2. How much rent will now be exempted from the TDS as per the Interim Budget 2019? Explanation: The Tax Deducted at Source (TDS) on fixed deposits and postal deposits will be exempted for interest earned up to Rs 40,000 from Rs 10,000 currently. The rent up to Rs 2.4 lakh will be exempted from TDS. 3. What is the total amount allotted for the Pradhan Mantri Kisan Samman Nidhi Yojana in the Bidget, 2019? Explanation: The Scheme ‘Pradhan Mantri Kisan Samman Nidhi’ will provide assured income to small and marginal farmers. Vulnerable farmers with 2 hectares of land will be given Rs 6000 per year. The complete expenditure of Rs 75000 crore for the scheme will borne by the Union Government. 4. Individual taxpayers will get a full tax rebate of upto? 5. How much amount of capital support is allocated for the Indian Railways in 2019-20? 6. How much direct income support will be provided to the farmers in a year under the new scheme? Under the Pradhan Mantri Kisan Samman Nidhi (KISAN), the vulnerable farmers, who own around 2 hectares of land, will get direct income support of Rs 6000 per year. The income support will be transferred directly to the account of the beneficiary farmer in three equal installments of Rs 2000 each. It would be fully funded by the Government of India. 7. How many crore LPG connections have already been distributed under PM Ujjwala Yojana, as told during the budget? Explanation: The government aims to make women in rural India free from the smoke of wood by providing cleaner fuel. The Government aims to deliver 8 crore free LPG connections to rural households, of which 6 crore connections have already been distributed under Ujjwala Yojana. In the next year, another 2 crore connections will be disbursed. 8. As decided by the union government, the container cargo movement to the North East will cross through which river? The government plans to introduce container cargo movement to the North East as well, by improving the navigation capacity of the Brahmaputra River.The Brahmaputra river is one of the major rivers of Asia. It is about 3,848 km (2,391 mi) long, the Brahmaputra is an important river for irrigation and transportation. 9. The Rashtriya Kamdhenu Aayog is set up for the welfare of which animal? 10. As per the Interim Budget, the 22nd All India Institute of Medical Sciences will be set up in? Explanation: There are 21 All India Institute of Medical Sciences (AIIMS) functioning currently in India. Of these 21, 14 AIIMS was set up under the present government. The 22nd AIIMS will come up in Haryana. 11. What amount has been allocated for the Pradhan Mantri Gram Sadak Yojana for construction of more rural roads? Explanation: Finance Minister Piyush Goyal presented the Interim Budget 2019-20 on February 1, 2019. It was the last Budget of the Modi Government before the 2019 Lok Sabha elections. The Budget allocates Rs 19000 crore for Pradhan Mantri Gram Sadak Yojana for construction of more rural roads. 12. Under the Pradhan Mantri Shram-Yogi Maandhan scheme, pension workers will get Rs. ___ after attaining the age of 60 years? Explanation: Considering that half of the GDP comes from the unorganised sector, Finance Minister announced the launch of the mega pension scheme ‘Pradhan Mantri Shram-Yogi Maandhan’ for the unorganised sector workers with income of less than Rs 15,000. Under the scheme, the workers will be able to earn Rs 3000 after attaining the age of 60 years. 13. In the Interim Budget 2019-20, how much amount has been allocated for the Mahatma Gandhi National Rural Employment Guarantee Act? Explanation: Finance Minister Piyush Goyal presented the Interim Budget 2019-20 on February 1, 2019. It was the last Budget of the Modi Government before the 2019 Lok Sabha elections. Rs 60000 crore were allocated for the Mahatma Gandhi National Rural Employment Guarantee Act (MGNREGA). 14. Finance Minister Piyush Goyal presented the Union Budget 2019-20 recently. This year Budget will be the Interim Budget. What is another term used for Interim Budget?? Explanation: Finance Minister Piyush Goyal presented the Union Budget 2019-20 on February 1, 2019. It was the last Budget of the Modi Government before the 2019 Lok Sabha elections. This year, the government gave the Interim Budget, also known as ‘Vote on Account’ as it is close to the end of its term. An interim budget is usually passed by the Lok Sabha without discussion. Explanation: In order to give relief to Senior Citizens, there is an increase in the deduction limit for medical expenditure for certain critical illness from Rs. 60,000 (in case of senior citizens) and from Rs. 80,000 (in case of very senior citizens) to Rs. 1 lakh for all senior citizens, under section 80DDB.